Classical Pilates Studio – loving pilates and all of our Journeys into Pilates! Well we have managed to survive January and February and finally the 1st of March has landed on our doorstep. This is an exciting time of year as spring is just around the corner. The studio is springing into life with our NEW studio manager Becky and we will soon have another instructor to help us grow. 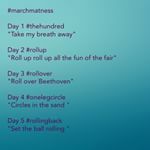 To keep us moving in March we have signed up to #MarchMatness – a celebration of everything to do with the Classical Mat. Everyday in March we will post pictures of the mat exercises with a phrase and we want you to post us back a picture that best represents the phrase for you! So we want ALL of you who love the mat to get involved….. post your pictures and tag the sponsors. We can’t wait to see what you come up with!! See you in the studio for March Matness fun! !